It can be difficult to grasp that in nearly 100 days the Rwandan genocide managed to take the lives of over 800,000 people; most of which were Tutsi’s. (Jones, 360) The conflict between the Hutu and the Tutsi people was not a recent development in the early 1990’s. These two groups of people had been at odds due to old colonial tensions, class division and the development of the Hutu Manifesto. (Gourevitch, 58) In the summer of 1994, with the death of Habyarimana, Rwanda’s leader, the mounting tensions broke and the genocide began. During the genocide the Hutu majority, who had been suppressed for many years, attempted to gain power in the country. The Hutu group Interhamwe, which functioned as a militia was key to the rise of Hutu power in Rwanda during this time. There were United Nation troops on the ground in Rwanda during this time but due to the deaths of ten Belgian soldiers and conflicting opinions, the UN troops were not given the authority to take any action other than insuring that communication lines stay open. Although there were safe areas that the UN troops protected, they were not able to contain all of the Tutsis who were sought out and massacred. 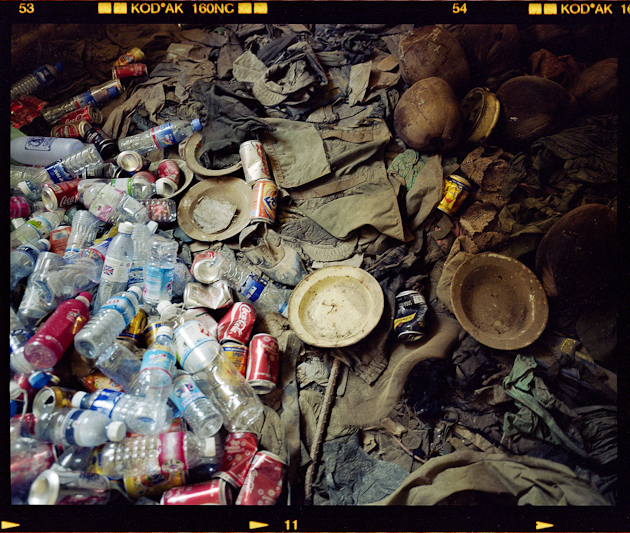 This pile contains some of the weapons used against the Tutsi people during the summer of 1994, yet the image contains only the weapons, not the perpetrators or the victims. A photograph of this nature seems to guide the viewer to question how the Hutu and Interhamwe forces gained access to such an incredible amount of machetes. The machete was a commonly owned tool in Rwanda because of its practical agricultural applications. In an effort to prepare for the genocide, agricultural tools such as the machete were imported into Rwanda in numbers that “greatly exceeded Rwanda’s agricultural needs.” (McNulty, 107) During the conflict the Hutu and the Interhamwe, wanted to mobilize as many members as possible and increase their strength through numbers. By distributing a common weapon, one that many people already had access to, the Hutu forces were able to organize a specific method of killing in which the majority of Hutu people could participate. The viewer can clearly see in this photograph that the machetes vary in type, which supports the idea that they were not all from the same source. As mentioned previously, the machete was a common tool that most Rwandan people owned, especially those who made their living in agriculture. The idea of individual weapons leads to the idea of individual killers. Where as some Hutu people were forced into the killings others volunteered. This picture suggests the greater social issue of what would drive such a vast majority of people to unite together and murder over 800,000 individuals in 100 days. 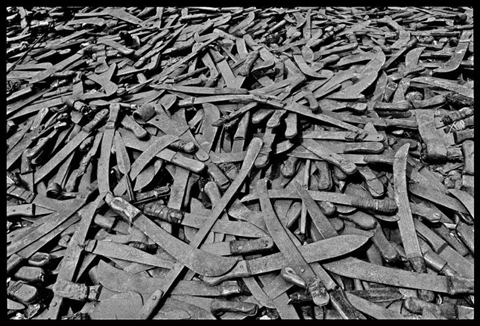 This photo does not include every machete used during the genocide in Rwanda but it suggests to the viewer that the amount of weapons and killers is not a number that can be easily imagined. Considering that the majority of the population was armed with machetes through “civilian self-defense programmes” the perpetrators vastly outnumbered the victims. Due to the circumstances of the genocide the Tutsi people were not well equipped to defend themselves. In situations such as this it is a popular idea that the United Nations or other foreign governments should become involved and intervene to stop the genocide. As mentioned earlier, in preparation for the genocide the Hutu majority began accumulating weapons from military grade firearms and grenades to machetes and hoes. (McNulty, 107) Through the accumulation of weapons they were able to train other Hutu groups on how to use the weapons in the most effective manner. The stock piling of weapons also provided the Hutu forces with an advantage over the Tutsi’s in not only number but in arms as well. The Interhamwe and Hutu forces were aware that even though they were accumulating guns, there would not be enough guns to arm every one of the members. This realization drove the Interhame to gather more accessible weapons such as spears, swords and even bows. (Verwimp, 7) After gathering the weapons the Hutu forces also taught their members how to use the weapons effectively. (Verwimp, 7) This photograph suggests that despite the technological advancements in weaponry- sheer numbers and forces will still prove to be extremely effective. By mobilizing the majority of their people, the Hutu forces were able to create an environment where individuals killed other individuals in a systematic manner. Considering that these machetes were used in the killings of many Tutsi and Tutsi sympathizers, it is interesting to note that due to the nature of a black and white photograph, it is difficult for the viewer to determine whether or not there is blood on the machetes. 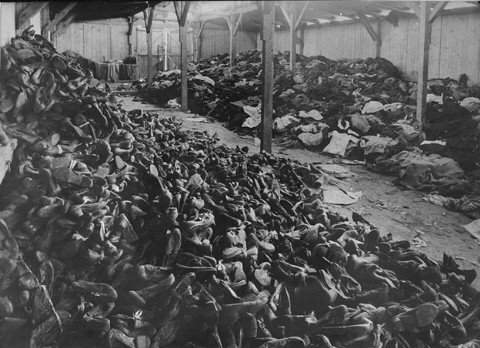 Not only does Nachtwey’s photograph remove the color from the photograph but he also removes the presence of victims as well as the perpetrators. Removing the history of the machetes and context in which they were found suggests to the viewer that the an overarching issue in cases of genocides, such as the one in Rwanda, is not just of the issue killings but also the issue of supplying and distributing weapons. Even though the Rwandan genocide is linked closely with the machete, it was most certainly not the only weapon used during the summer months of 1994. There was a distribution of firearms among the Hutu forces, which were used in places that housed high numbers of Tutsi refugees. (Verwimp, 7-8) This photograph contains only a pile of machetes but there aren’t any visible military weapons with which the police forces were equipped. Machetes accounted for approximately 52.8% of the killings during the genocide. (Verwimp, 13) Despite the weapon of choice for the majority of the murders, this photograph neglects to address the usage of firearms and other military weapons that were used during the genocide. The fact that a machete was a commonly owned tool in Rwanda complicates the issue of whether or not the other countries who supplied the agricultural tools to Rwanda, in increased proportions, during the time preceding the genocide are responsible for arming the Hutu forces. It is worthwhile to note that in the time leading up to the genocide Rwanda was enduring a conflict between the Hutu and the Tutsi people. This conflict had been going on for many years, most likely due to old colonial tensions, and many of the weapons that were imported prior to the genocide were used to arm either side of the conflict. The increase in weapons allowed for the specialization of killings in Rwanda. The Interhamwe and other Hutu forces were able to choose a specific weapon and type of killing to increase the death count in each situation. The guns and grenades were reserved for the police like Hutu forces and they were used in order to kill a great number of Tutsi’s. (Verwimp, 7) Usually the Interhamwe targeted churches and other refugee centers with grenades and gunfire. (Verwimp, 8) The machetes initially were part of the mass killings but because the availability of guns allowed for the Interhamwe forces to specialize their killings, the machetes were then used for killings in open spaces where the victims were not in large numbers. An image has the power to evoke an array of feelings and tell a story without words but in that story complications and questions can arise. Jim Nachtwey’s photograph of the abandoned machetes can lead the viewer to many different conclusions but they all meet back at Nachtwey’s original purpose: bringing awareness to “critical social issues.” By using a photograph that displays so much yet in the same light lacks definite information, Nachtwey has provided the viewer, at least in my case, with the desire to answer the question and find out more about the context of the photo. Spreading knowledge about the genocides that happen around the world is a way to engage the public in essential issues, so that hopefully, by raising awareness, there will be effective action taken against any genocide that may happen in the future. After researching this particular image from James Nachtwey, it was brought to my attention that there are other photographs with similar content style. I thought it would be best to acknowledge and include some of these images. 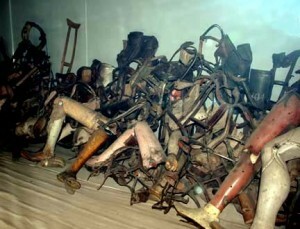 The images come from various different genocides and they include items that are from the perpetrators as well as the victims. 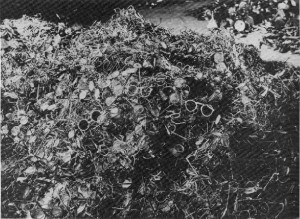 There are images that contain piles of bodies but I chose to leave out such images and focus on photographs that contain objects from various genocides. Finally I would like to comment on the last image that depicts a sculpture. 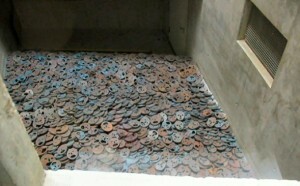 This sculpture follows the same “pile” form that the other images contain and although the image does not represent objects from a particular genocide, it is composed in memory of a genocide. All of the images that I have provided have been collected and preserved for one reason or another and despite the fact that we may never know why, the images themselves still maintain an importance in the stories that they reveal. Jones, Adam. Genocide: A Comprehensive Introduction, Second Edition. New York: Routledge, 2011. Print. Gourevitch, Philip. We Wish to Inform You That Tomorrow We Will Be Killed With Our Families: Stories From Rwanda. New York: Picador, 1998. Print. Verwimp, Philip. “Machetes and Firearms: The Organization of Massacres in Rwanda.” Journal of Peace Research 43.1 (2006): pag. 5-22. Web. 4 April 2012. McNulty, Mel. “French arms, war and genocide in Rwanda.” Crime, Law and Social Change 33 (March 2000): pag. 105-129. Web. 4 April 2012. Nachtwey, James. Interviewed by Elizabeth Farnsworth. A Coversation With, 16 May. 2000. Web. 4 April. 2012.